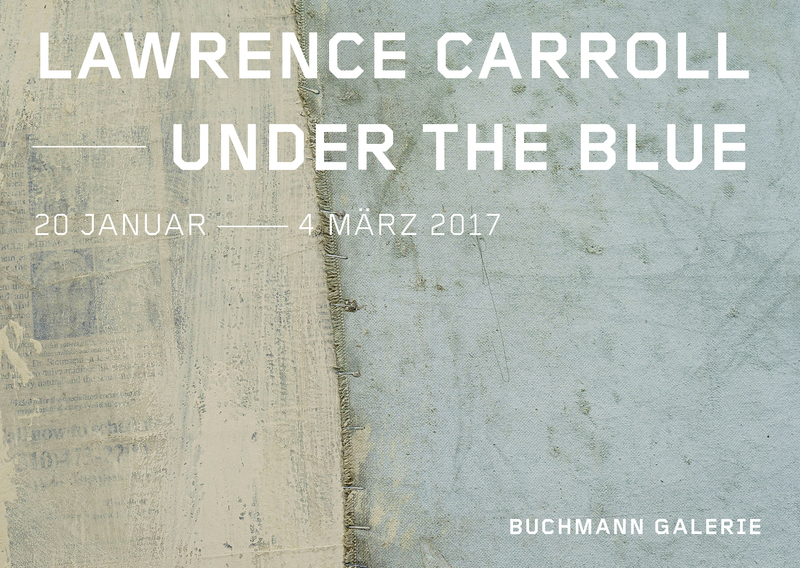 The Buchmann Galerie is delighted to announce its latest exhibition; Under the Blue featuring works by Lawrence Carroll (born in Melbourne 1954). Time plays a leading role in the current works of the artist, who lives in the USA and Italy. A large proportion of his latest work came into being over long periods of time and in part in different studios. For instance the large-sized paintings, measuring in the region of three metres in height, were begun in Carroll’s studio in Malibu in 2003 and were completed in 2016 in Marquette, Michigan at Lake Superior. This also applies to the sculptures on exhibition which required a period of six years before taking on their final form. The works are determined by concerns for the instant in time and have been evolved for the sake of this moment. Carroll allows himself to be guided by time, waiting and tranquillity. Nothing happens in an abrupt fashion. Lawrence Carroll’s work is strongly characterized by his exploration of minimalistic trends in art. His own remarkable answer to the questions arising from minimalism in subsequent artistic generations is what makes Carroll’s work so unique. As a reaction to the deadpan blind alley of positivist minimalism he turned to the specific and emotional qualities of painting. Poor quality materials are subjected to a long and intensive processing and reflection until their original fabricated properties have all but been disintegrated. The proverbial ‘hand of the artist’ disappears in the material used in Carroll’s paintings and sculptures due to its extended time of processing. According to Lawrence Carroll, ‘The painter lets go of something and the painting retains this within itself’. "... the piece to the puzzle was my decision to paint the insert canvas’s in the Sleeping Paintings this wonderful light sky blue - It took over a month in exploring different blues to decide on this value of the color. I had 30 different painted swatch colors of blue in all shades and values, but this is the one I chose. These paintings where all painted also in natural light." Lawrence Carroll’s biography regarding exhibitions is considerable to say the least. Deserving a special mention is his participation at the Venice Biennale in 2013 in the Vatican Pavilion as well as the Documenta IX. Recently he also had a solo exhibition at the MAMbo - Museo d'Arte Moderna di Bologna. Before this he had exhibitions at the Dublin City Gallery - The Hugh Lane, at the Casal Solleric in Palma de Mallorca and at the Jumex Collection in Mexico City. Further solo exhibitions are planned for the Museo Vicenzo Vela, Ligornetto in Switzerland and in the Art Museum ‘Kloster Unser Lieben Frauen’ in Magdeburg. A Newspaper designed by Lawrence Carroll will be appearing in conjunction with the exhibition. If you wish to obtain further information on the artist, please do not hesitate to contact the gallery. Die Buchmann Galerie freut sich, mit Under the Blue eine neue Ausstellung von Lawrence Carroll (*1954 in Melbourne) anzukündigen. In den aktuellen Arbeiten des in den USA und Italien lebenden Künstlers spielt Zeit eine bedeutende Rolle. Große Teile der neuen Arbeiten sind über lange Zeiträume und teilweise in verschiedenen Ateliers entstanden. So wurden die großformatigen Gemälde - Objekte von drei Metern Höhe - in Carrolls Atelier in Malibu 2003 begonnen und 2016 in Marquette, Michigan am Lake Superior beendet. Auch die Skulpturen in der Ausstellung nahmen über einen Verlauf von sechs Jahren ihre endgültige Form an. Die Arbeiten sind von der Sorge um den Augenblick bestimmt, und um des Augenblicks willen geboren. Carroll lässt sich von der Zeit, vom Warten und von der Ruhe führen. Nichts geschieht schlagartig. Die Werke von Lawrence Carroll sind stark geprägt von einer Auseinandersetzung mit minimalistischen Strömungen in der Kunst. Seine bemerkenswerte eigene Antwort auf die Fragen, die der Minimalismus den nachfolgenden Künstlergenerationen stellte, macht Carrolls Werk so einzigartig: Als Reaktion auf den „Deadpan“, die Sackgasse des positivistischen Minimal, wendet er sich den spezifischen, auch emotionalen Qualitäten der malerischen Mittel zu. Arme, „povere“ Materialen werden im Atelier einem langen und intensiven Prozess der Bearbeitung und Reflexion ausgesetzt bis ihre „Gemachtheit“ sich nahezu aufgelöst hat. Die sprichwörtliche Hand des Künstlers verschwindet bei Carroll im lange bearbeiteten Material seiner Malereiobjekte und Skulpturen. „Der Maler lässt etwas los, und das Gemälde hält es dann in sich“, so Lawrence Carroll. Lawrence Carrolls Ausstellungsbiographie ist umfangreich, erwähnt werden sollte seine Teilnahme an der Biennale in Venedig 2013 im Vatikanischen Pavillon sowie der Documenta IX. Zuletzt war von Lawrence Carroll eine umfangreiche Einzelausstellung im MAMbo - Museo d'Arte Moderna di Bologna zu sehen. Davor waren seine Werke in der Dublin City Gallery The Hugh Lane, im Casal Solleric, Palma de Mallorca und in der Jumex Collection in Mexico City ausgestellt. Kommende Einzelausstellungen werden im Museo Vela, Ligornetto, Schweiz und im Kunstmuseum Kloster Unser Lieben Frauen in Magdeburg sein. Zur Ausstellung erscheint eine von Lawrence Carroll gestaltete Zeitung. Museum of Contemporary Art, San Diego Calif.